Last week, we visited friends who live in the beautiful Aquitaine region, in south-western France. The climate there is very different from where we are, it is cooler and greener than chez nous. Perfect conditions for hydrangeas, which I absolutely love, but can't have at home as they would get blasted in the summer heat. Aren't they fabulous? We had scarf wearing temperatures the whole time, a wonderful extra bonus. Hooked on black&white for the moment, teaming up with a 'Les Clés' Pointu in the basic slide knot, and a moyenne scarf ring in black. We had a happy time, and kicked off the evenings with a game of croquet and an aperitif.. Earlier that day, we took a trip to the Pyrénées, and had a wonderful pique-nique lunch by a wild stream..
My computer will have a much deserved rest coming up, as I am going to 'partir en vacances'.. Looking super chic there, I love playing croquet, it's the essence of summertime. 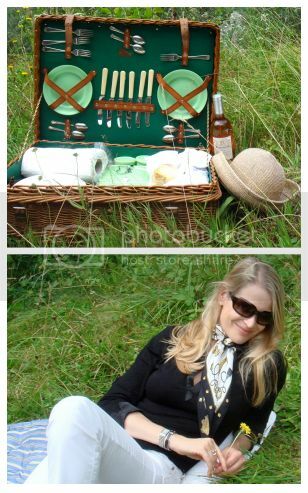 You look wonderful- what a lovely garden and picnic basket too. I love hydrangas but have no luck growing them, more's the pity. Oh, for "scarf-wearing weather"! It's been much too hot and humid this summer, and I don't have air conditioning at work, so I miss my scarves! I also have a new pointu with which I plan to use my new MaiTai Collection petite scarf ring! Bonnes vacances, Chere MaiTai! Des belles fleurs and Hermes scarves -- it doesn't get any better than that! One more delightful post dear MT. Thank you.... but, oh no, I am suddenly wanting a Pointu!! Yesterday I took some time for myself and one of the enjoyable things I did was go back through all of your posts-- from beginning to end. Your generous spirit shines through each one and I want to say thank you again for all the beauty you share. Wishing you a lovely vacation. Hydrangeas are one of the benefits (along with scarves) of living in a cooler climate! Enjoy your hols MaiTai - Looking chic as always! You look beautiful!!! Enjoy your holidays!Looking forward to having you back. Hug. 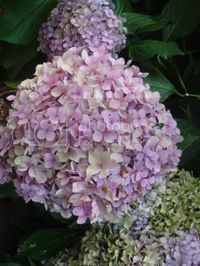 We have hydrangeas but they certainly don't last through summer - unfortunately the first really hot spell usually wilts them terribly. But I do adore them, they are so lovely. 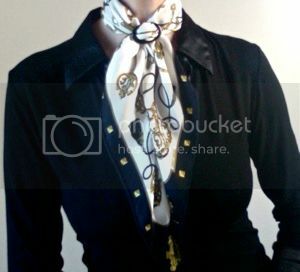 Your outfit is gorgeous today - I love how the scarf ring works with this scarf - it's divine! Beautiful Mai Tai! I'm going to copy your look tomorrow at work, casual Friday. 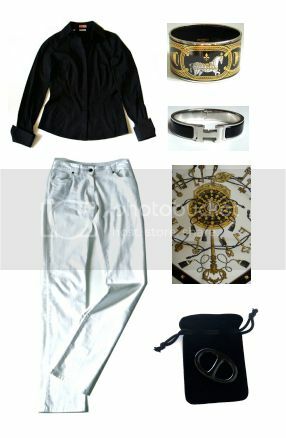 Black 3/4 t-shirt, white jeans, black and white and gold scarf. 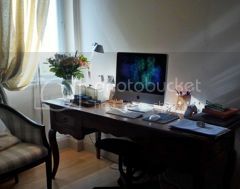 Love your desk. I have a small secretary that I love. Sometimes I set up my lunch there! Have a wonderful vacation. looks and you are too chic for words! I am stuck in a black and white mode also. Where is Fellini when you need him??? I loved seeing you with your croquet mallet. I have not played since I was a child and that used to be a favorite summer activity! Wishing you a wonderful holiday and I know we all look forward to seeing the highlights upon your return. You look great. The scarf is beautiful. Perfect Tying to your outfit. You look so pretty and chic, and the picnic looks wonderful. What lovely photos, thank you for sharing them. My scarf rings arrived Friday and they are fabulous. I can hardly wait for cooler weather to use them! My dear hair-mess, you are truly the sweetest, thank you. It is wonderful to finally see the beautiful little H fairy here, I hope it will bring us all luck and many orange boxes! Dear Penney, your ingenious method might be the answer to my hydrangea prayers (hope Faux Fuchsia and Miss Kitty-Cat are reading this too), especially since the flowers keep so well in the house, and look beautiful when dried. Will try your method next year, mille merci!! Hello A, and merci for the good holiday wishes! Many thanks for the sweet ‘bon vacances’, dear cecilia. So nice though to be back too! Aww, the cooler climate is growing more and more on me, dear sushi queen!! Let me know when you are ready for a house swap! Many thanks for your kind comment, dear scarf. Happy you liked the knot and look! Congratulations on finding your dream scarf, dear Frances! The Les Rubans du Cheval is a true classic, and the CW you have picked is just beautiful. Hope you are the proud owner by now, and wishing you many more orange boxes to come! Dear Marilyn, so pleased to hear that you are happy with your scarf rings, wishing you much fun and enjoyment with them! Merci for your lovely comment, have a great week ahead. Hello Melissa, and thank you.I love shopping in London, but luckily France offers fabulous shopping too. There are a few things which are hard to get here though. I am addicted to Malden sea salt and love Dish-matic washing up brushes, and when in the UK, I stuff my suitcase with both! Would you mind doing a post on how you care for your scarves - how they are stored, and if you launder and iron?